I recently bought a small vacuum pump for a project (I will get into that at a later date) and found it to be surprisingly noisy. At first I thought the noise was emanating from the housing itself, but when I blocked the outlet port with a finger the noise was cut down dramatically. A colleague suggested a muffler (thanks Keith!) and another gave me some tips on how they work (thanks Andy!) so I set out to make one. It turns out there are several strategies for muffler design, and some of them get complicated, acoustically speaking. Most engine mufflers are optimized for unrestricted air flow, as air resistance saps horsepower. 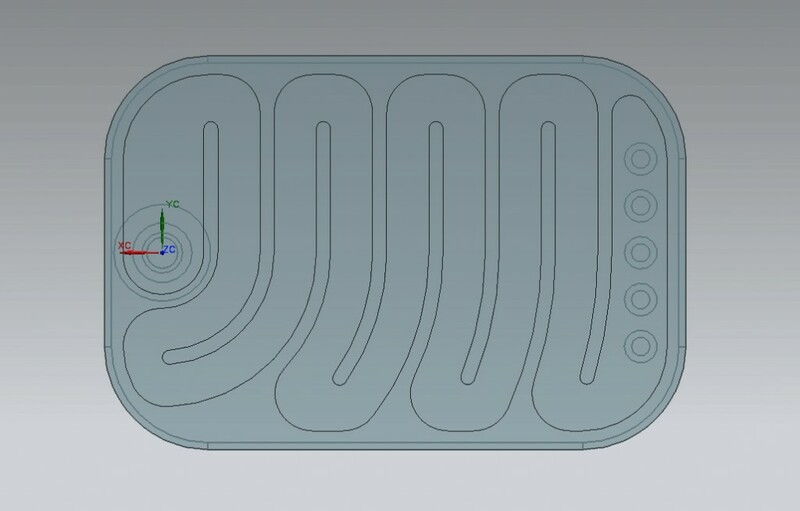 In my case the air flow is relatively low and I’m not concerned about a fractional drop in suction, so I went with a simple maze-like muffler design, intended to disperse and diminish sound pressure as the waves travel through the maze. then glued the two halves together. 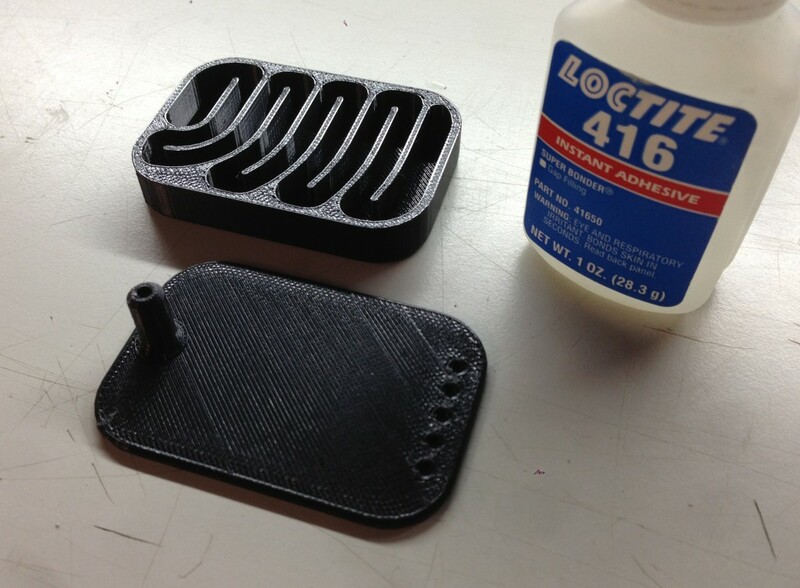 Is there anything Loctite can’t do? 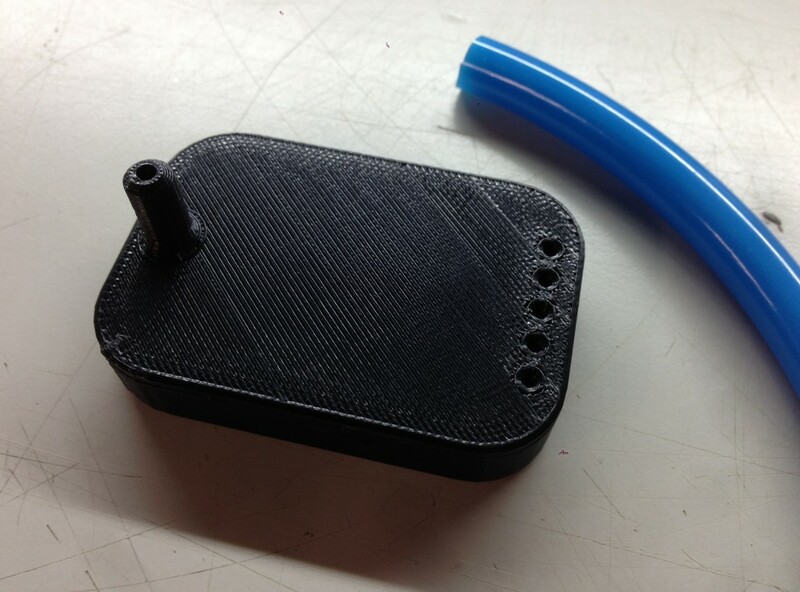 The inlet port is sized for my 1/4″ ID hose, although in a future iteration I would add a barb feature to make the attachment a little more positive. For now I’ll just use a small hose clamp. The entry 'vacuum pump muffler' was posted on March 19th, 2013 at 10:23 am	and last modified on March 19th, 2013 at 10:23 am, and is filed under 3D printing. You can follow any responses to this entry through the RSS 2.0 feed. Both comments and pings are currently closed. You have way too much time on your hands but I love it. Great idea and execution. I hope that you intend to sell your product either directly to vacuum pump mfgs that they can incorporate into their offerings or directly to end users. Nice….can I get one for my wife? One of the great things about 3D printing is that you don’t need to worry about traditional manufacturing requirements; why did you make it out of two pieces that you had to glue together, instead of just making it as a single unit? Thanks Scott, it’s a good question. I could have made the muffler as one piece and the slicing software would have simply filled the inside with support material. We use the SST support material on our Dimension machine, so it could have been dissolved out but it would have taken a day or so in the sodium hydroxide bath. If cleverly designed, the part might have been buildable without support material, by providing inwardly drafted walls meeting at points (like an arch) to support “ceilings”. But in the end it was simpler and faster for me to build two pieces and glue them. Why did you use rounded corners versus sharp corners? My understanding is that sharp corners tend to make the sound wave diffract, while rounded corners tend to preserve the wave. It would seem to me that promoting the waves to break down into as many out of phase “sub” waves would help, or am I not getting the exact way mufflers work? Are you willing to share the cad file? I’m looking for a “first” project for the 3D printer we just got at work, and I can use one of these! you could get better results by increasing mass on the sides of the muffler. Well done BTW. Ah OK, makes sense. I was thinking of an SLS process, which is what we work with; no need for support structures (you just flush out any unsintered powder when you’re done).